For other uses, see Sweet and Sour (disambiguation). Some authors say that the original sweet and sour sauce (simplified Chinese: 糖醋酱; traditional Chinese: 糖醋醬; pinyin: tángcùjiàng) came from the Chinese province of Hunan, but the sauce in this area is a light vinegar and sugar mixture not resembling what most people, including the Chinese, would call sweet and sour. Many places in China use a sweet and sour sauce as a dipping sauce for fish and meat, rather than in cooking as is commonly found in westernized Chinese cuisine. This style of using sauces is popular amongst Chinese who tie certain sauces to particular meats such as chili and soy for shrimp and vinegar and garlic for goose. There are, however, some dishes, such as the Cantonese sweet and sour pork or Loong har kow (sweet and sour lobster balls), in which the meat is cooked and a sauce added to the wok before serving. Not all dishes are cooked; some, such as "sweet and sour fruit and vegetable" salad from the eastern regions of China, also find their way in Chinese cuisine. This dish combines salad vegetables such as cucumber, tomato, bell pepper, and onion with a mixture of pineapple (or pear), vinegar, and sugar to make a cold served dish. In China traditionally the sauces are made from mixing sugar or honey with a sour liquid such as rice vinegar, soy sauce, and spices such as ginger and cloves. Sometimes a paste made from tomatoes is used but this is rare and normally restricted to western cooking. Cantonese sweet and sour sauce is the direct ancestor of sauce of the same name in the West, and originally developed for sweet and sour pork. The late renowned chef from Hong Kong, Leung King, included the following as his sweet and sour source sauce recipe: white rice vinegar, salt, Chinese brown candy, ketchup, Worcestershire sauce, and dark soy sauce. Hong Kong's gourmet Willie Mak, himself a long time friend of Leung, suggests contemporary eateries not to resort to cheap bulk manufactured versions of vinegar, ketchup, and Worcestershire sauce, or the sauce will risk being too sharp in taste and might break the balance of flavours. He suggests the more acidic white rice vinegar could be replaced with apple cider vinegar, and ketchup and Worcestershire sauce should be of renowned gourmet brands. Guō Bāo Ròu (simplified Chinese: 锅包肉; traditional Chinese: 鍋包肉; pinyin: guōbāoròu) is a classic dish from North East (Dongbei) China, originating in the city of Harbin, Heilongjiang Province. It consists of large thinly sliced pieces of pork in potato starch batter, deep-fried twice until crispy. They are then lightly coated in a variation of a sweet and sour sauce, made from freshly prepared syrup and rice vinegar, flavoured with ginger and garlic. The batter absorbs the sauce and softens. A Beijing variant has the sauce thin and watery, while the dish as prepared in the North East is often a thicker sauce with some ketchup added to it. However true Guō Bāo Ròu is made with an amber coloured sauce due to the fact that it uses caramelized sugar. From Jiangsu province, the Squirrel-shaped Mandarin Fish (Chinese: 松鼠桂鱼; pinyin: Sōngshǔ guì yú) has a crisp skin but soft centre. The fish body is scored such that it fans out when cooked, similar in appearance to a bushy squirrel tail. The fish is served with a sweet and sour sauce drizzled on top and garnished with a little shrimp meat and dried bamboo shoots. A speciality of Shandong province, in particular the city of Jinan, the Yellow River Carp is prepared by making diagonal slices partway through its flesh. It is next coated in corn flour then deep fried causing the fish to curl and the slices to open out. 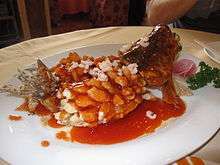 Finally a sweet and sour sauce is poured over the cooked fish. This is one of the distinctive dishes typical of Lu Cuisine. A popular dish in Shanghai cuisine, sweet and sour spare ribs (Chinese: 糖醋小排; pinyin: tángcù xiǎopái), is made using pork ribs that are lightly coated in corn starch and seasoned before being fried and served in a sweet and sour sauce. The original Cantonese sweet and sour pork (simplified Chinese: 咕噜肉; traditional Chinese: 咕嚕肉; pinyin: gūlūròu; Jyutping: gu1 lou1 juk6) is made with vinegar, preserved plums and hawthorn candy for an almost scarlet colour and sweet-sour taste. A related Hong Kong/Cantonese-based dish is sweet and sour spare-ribs (Chinese: 生炒排骨; pinyin: Shēng chǎo páigǔ English translation: stir-fried spare ribs) and it is identical in methods except spare-ribs are used in place of pork loins. Western cultures use sweet and sour sauce in two different ways. Dishes can either include the sauce as an ingredient in cooking or use the sauce as a pour-over or dipping sauce for the meal. Sweet and sour sauces have been used in English cuisine since the Middle Ages, with recipes for sweet and sour meat and fish in the 1390 cookery book The Forme of Cury. Chinese restaurants in Western countries commonly serve chicken, pork, or shrimp that has been battered and deep-fried, then served with a sweet and sour sauce poured over the meat. It is also common to find the sweet and sour sauce cooked with sliced green peppers, onions and pineapple before it is poured over the meat. Many western dishes involve cooking the meat with a variety of ingredients to make a complete sweet and sour dish in the manner of the Gu lo yuk. The most popular dishes are those of pork and shrimp. In French cuisine, it has been developed contrary to traditional French cooking practices and preparation of sweet and sour sauce (Aigre-douce) often involves immersing the food in a plentiful amount of sauce. Common in Western sweet and sour sauce is the addition of fruits such as pineapple and vegetables such as sweet pepper and green onions. Traditional rice vinegar is becoming more readily available due to the increase in Asian food stores but a mixture of vinegar and dry sherry is often still used in sweet and sour dishes. Also common is the use of corn starch as thickener for the sauce and tomato ketchup to give a stronger red colour to the dish and to add a Western taste. Most supermarkets across Europe and America carry a range of prepared sweet and sour sauces either for adding to a stir-fry or for use as a dipping sauce. Primarily in North America, sweet and sour sauce is available in small plastic packets or containers at Chinese take-out establishments for use as a dipping sauce. In Britain, Thai-style sweet chilli dipping sauce has recently overtaken the previous popularity of Chinese-style sweet-sour sauce to the extent it can often be found at non-Asian establishments for a wide variety of western-style snacks from fishcakes to chips and seafood such as calamari and prawns. A number of variations are used in barbecue cuisine, either home-made or prepared from a number of common brands. Besides American Chinese restaurants, popular fast food restaurants such as McDonald's, Burger King, and Wendy's carry their own brand of sweet and sour sauce packets. These are commonly used as a dipping sauce for Chicken fingers and chicken nuggets. 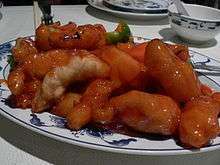 Sweet and sour chicken is a dish frequently served in Chinese restaurants in various Western countries. It is common in Australia, Europe, North America and South America, and is available at some restaurants in East and Southeast Asia in an essentially identical version. 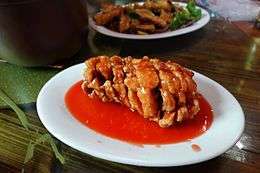 The dish generally comprises cubes of white meat chicken deep-fried in batter and served with sweet and sour sauce. Sometimes it is topped with pineapple, green pepper, carrot, or sweet pickles. Sweet and sour pork is a Chinese dish particularly popular in westernised Cantonese cuisine and may be found all over the world. Several provinces in China produce various dishes that claim to be the ancestor including a traditional Jiangsu dish called Pork in a sugar and vinegar sauce (糖醋里脊; pinyin: táng cù lǐjǐ). In South Korea, it is known as tangsuyuk (탕수육). It is one of the most popular non-Korean dishes in the country. The dish consists of deep fried pork in bite sized pieces, and subsequently stir-fried in a more customized version of sweet and sour sauce made of sugar, ketchup, white vinegar, and soy sauce, and additional ingredients including pineapple, green pepper (capsicum), and onion. In more elaborate preparations, the dish's tartness is controlled by requiring that Chinese white rice vinegar be used sparingly and using ketchups with less vinegary tastes, while some restaurants use unripe kiwifruits and HP sauce in place of vinegar. Some of the more casual food outlets use diluted acetic acid as a substitute for white vinegar and synthesized red colouring in place of ketchup to keep the costs down, making the dish too pungent and leaving customers thirsty. ↑ Simoons, Frederick J (1991). Food in China: A Cultural and Historical Inquiry. CRC Press:Boca Raton. ↑ Patten, Maguerite (1973). International Cooking in Colour. Hamlyn, Middlesex, England. p. 113. ↑ Doeser, Linda (2001). Asian Cooking. Hermes House. p. 370. ↑ Kiple, Kenneth F; Kriemhild Conee Ornelas (2000). Cambridge World Encyclopaedia of Food, Volume II, China. Cambridge University Press:, Cambridge, England. pp. 1165–1175. ↑ Mak, Willie (17 August 2007). "Sweet and Sour Spare-ribs". Eat and Travel Weekly. Eat and Travel Weekly Company Ltd, Hong Kong (629). ↑ "锅包肉"来自道台府. 生活报 (in Chinese). 黑龙江新闻网. 25 October 2005. Retrieved 1 March 2014. ↑ "Food and Dining". classicsuzhou.com. Suzhou Tourism Bureau. 2 November 2013. Retrieved 2 November 2013. ↑ "Sweet and Sour Yellow River Carp". www.china-sd.com. Information office of Jinan Municipal People's Government. 2 November 2013. Retrieved 2 November 2013. ↑ Chang, K.C (Ed) (1977). Food in Chinese Culture: Anthropological and Historical Perspectives. Yale University Press, :New Haven. p. 362. 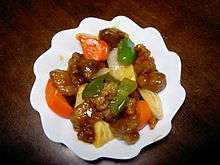 Wikimedia Commons has media related to Sweet and sour sauce, Sweet and sour chicken and sweet and sour pork.